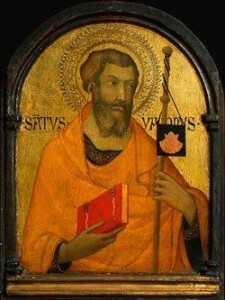 Today we liturgically remember a witness of the Lord, Saint James the Greater, Apostle. Sadly, we also must pray for the 77 people killed, and countless others injured, in a train accident on the 24th in Compostela; some headed home, many going for the annual feast. James was one of the witnesses of the Transfiguration and one of those who slept through most of the Agony in the Garden. He was the first of the apostles to be martyred. The Tradition of the Church says that the relics of Saint James were brought to Spain sometime after his martyrdom. The shrine at Compostela is one the greatest pilgrimage center in western Europe. One of the symbols of Saint James is the scallop-shell, is also the emblem of pilgrims generally. It’s easy for us to criticize James and John and their mother, as if none of us at some time or another have not been guilty of having made selfish requests of God! Yet the lives of these people give us hope that as our relationship with God matures, human selfishness might be replaced by service. For his part, St. James did indeed achieve that greatness he desired. But he did so only through service- by drinking the chalice of Jesus, and giving his life for him. Today’s feast is an opportunity for us to ask ourselves: Are we selfish, or are we servants? St Paul reminded us a moment ago that the treasure of God’s power within us belongs to him, not us and is carried through this life in earthenware vessels. We may yearn for status and a sense of importance, even an entry in Who’s Who but Jesus and the scriptures remind us that God’s way is radically different from human standards and values. James truly was a Son of Thunder and had learnt bravely that to be on the right hand or the left hand of Jesus in glory, was to experience something of the pain and ignominy of Calvary. Saint James, pray for Spain, and pray for each of us! The truth, thought cold and void of breath. Your teacher, Jesus Christ, the Way. As witness of his victory. The flame of love within our heart. To sing your ever-lasting praise. Today is a perfect day to pray for the Pope and our bishop. It is also a perfect day to pray for Christian unity and to pick up a good book on the Church’s history. Perhaps even pray with Matthew 16. 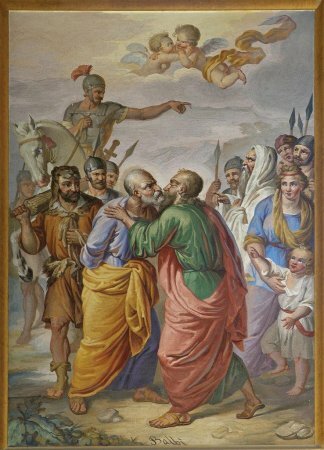 Grant, we pray, O Lord our God, that we may be sustained by the intercession of the blessed Apostles Peter and Paul, that, as through them you gave your Church the foundations of her heavenly office, so through them you may help her to eternal salvation. O God, who decreed that Saint Barnabas, a man filled with faith and the Holy Spirit, should be set apart to convert nations, grant that the Gospel of Christ, which he strenuously preached, may be faithfully proclaimed by word and by deed. 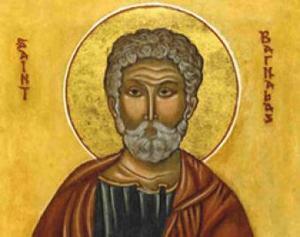 Saint Barnabas died in AD 61. What we know of Barnabas comes most from the Acts of the Apostles, which we heard in today’s Mass readings but he also shows in several of Saint Paul’s Letters. Who was Barnabas? Some scholars say that Barnabas was the cousin of Saint Mark on the basis of Colossians 4. We know he was of the tribe of Levi (making him a member of the priestly class), a native of Cyprus and a landowner there before selling the land to support the Church in Jerusalem, Moreover, he was trained in the Christian faith and a teacher of the same (see Acts 13). 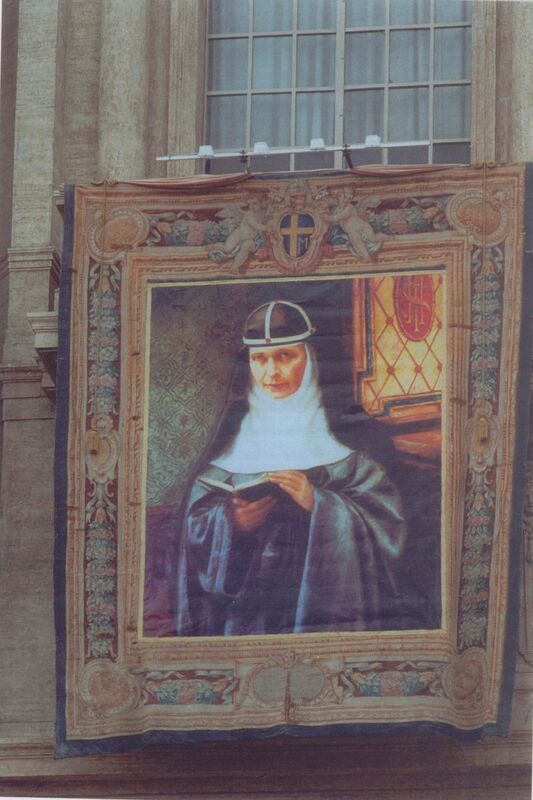 The Sisters of Saint Birgitta honor their second foundress, “Bridget the Second,” the woman who restored the Order of the Most Holy Savior, Blessed Mary Elizabeth Hesselblad. Her liturgical feast celebrated today. Blessed Mary Elizabeth immigrated to the USA and converted to Catholicism through a Jesuit at Georgetown University. 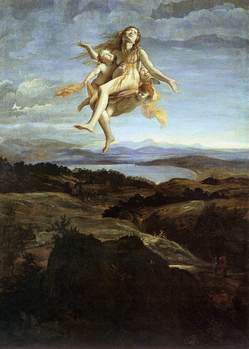 In time she felt called to refound the ancient order first founded by the Swedish saint Bridget, the Order of the Most Holy Saviour in the mid-14th century. The order is a semi-contemplative order of nuns officially approved by the Holy See on 7 July 1940, though it came together in 1911. The nuns run retreat houses and have some ecumenical work with the Protestant communities. The Order of the Most Holy Saviour is a fascinating part of our Catholic ecclesial history in that the order of nuns and priests were part of a double monastery dedicated to the Lord’s passion. The chaplains were under the rule of the abbess. The nuns have foundations in different parts of the world while there is one priory of monks in Oregon and they don’t actively collaborate with the nuns. The Bridgettines have a convent and retreat house in Darien, CT (in the Diocese of Bridgeport). 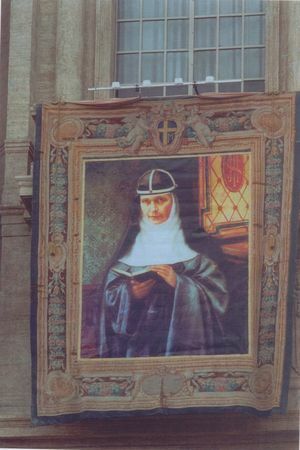 In addition to Blessed Mary Elizabeth Hesselblad, the Church raised up and bestowed the title of blessed on Mother Mary Riccarda Beauchamp Hambrough, Mother Mary Catherine Flannagan and Sister Mary Magdalen Moccia on 21 October 2011. Blessed Mary Elizabeth, pray for us.